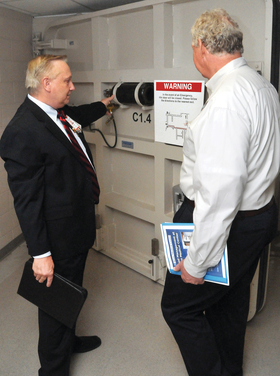 Bert Gumeringer, left, director of facilities and security at Texas Children's Hospital, shows FEMA Deputy Administrator Rich Serino the operations of a "submarine door"--one of many designed to halt flooding in the tunnel system under the Texas Medical Center. Story​ updated​ Sept.​ 1,​ 2017. Hurricane Harvey continues to ravage southeast Texas on an unprecedented scale and that's put disaster preparedness back in the forefront. Yet, experts say an executive order that President Donald Trump recently signed easing infrastructure regulations would put hospitals in a vulnerable position during any future natural disasters. Harvey has brought historic levels of rain to the area and has claimed several lives, sparked a public health emergency, shuttered hospitals and upended Houston and the surrounding area—"beyond anything experienced," the National Weather Service said. The city's largest safety-net provider, Ben Taub Hospital, is being evacuated as the basement storing pharmacy supplies, food and medical equipment continues to take on water. The University of Texas MD Anderson Cancer Center in Houston and Citizens Medical Center in Victoria have closed. Still, many Texas hospitals were well-prepared, having implemented submarine doors and elevated power supplies after Tropical Storm Allison struck in 2001. But on Aug. 15, Trump signed an executive order that immediately rolled back a previous order aimed at helping flood-prone communities prepare for the impact of climate change and rising sea levels. The Obama-era order required that new critical buildings such as federally funded hospitals or medical facilities be built at least 3 feet above the national 100-year flood elevation standards or to at least the 500-year flood plain. The Obama administration said mandating more stringent building regulations in areas vulnerable to floods could increase construction costs but save taxpayer money over the long term. Trump, who does not believe in climate change and whose administration has stripped language and mentions of climate change from federal websites, wants to bolster infrastructure spending and streamline the "painfully slow, costly and time-consuming process for getting permits and approvals to build," as he described. With the new order in place, cities, counties, states and individual healthcare systems must evaluate their situation and build accordingly, according to the architecture firm NBBJ, which has designed hospitals for the Cleveland Clinic, University of California at Los Angeles and NYU Langone, among other providers. The firm is concerned that the tighter restrictions were revoked without adding any new protections or considerations, said Mackenzie Skene, healthcare partner at NBBJ. The White House did not respond to a request for comment on the order. "Every foot counts," Skene said. "Building 3 feet above flood elevation—as was suggested by former President Obama's regulations—could mean the difference between full hospital functionality and a complete failure of electrical, plumbing and mechanical systems." And in fact, the Louisiana State University Hurricane Center estimated that stronger building codes would have saved around $8 billion in damage to New Orleans incurred during Hurricane Katrina. NBBJ worked on two major hospital replacement projects in New Orleans that featured an "upside-down hospital" design strategy that placed critical infrastructure typically relegated to the basement, well above flood stage—in some cases seven floors up. At University Medical Center, the first "mission critical" floor is 21 feet above base flood elevation, Skene said. Memorial Hermann Health System in Houston was working on ensuring the safety of its patients and was unable to comment on the eased regulations, as was Catholic Health Initiatives St. Luke's Health in Texas; Kindred Healthcare, which has locations in Texas and New Orleans; and Ochsner Health System, Tulane Medical Center, East Jefferson General Hospital and Terrebonne General Medical Center, all in the New Orleans area. "Even after Hurricane Katrina and Hurricane Sandy—which killed at least 1,400 people and caused $179 billion in damage (combined)—there are relatively few protections in place that safeguard healthcare facilities from storms," Skene said. Among the few requirements are floodwall systems with passive floodgates. Cleveland Clinic said easing the Obama-era regulations would not affect how it builds facilities going forward. At one of its construction projects in Florida, the clinic raised a surgery center's floor level above code requirements and installed impact-resistant glass, resulting in "minimal, if any" added costs, said Frank Aucremanne, Cleveland Clinic executive director of buildings and properties. "Our resilience to withstand extreme weather is critical," he said. "We will go beyond code in many ways to make our buildings healthier and more affordable to operate."